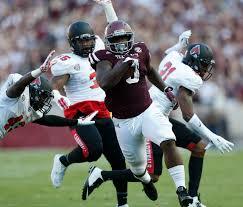 RB-Tra Carson, Texas A&M, 5′ 11″ 227 lbs.Cons: Carson is not a fluid athlete. He runs too high, and has very tight hips that force him to take multiple steps when changing directions. It’s this stiffness that makes him more of a thumper which when combined with his limited vision, leaves a lot of yardage on the field. The back only has one speed, tends to waddle when he runs, and will typically get you two yards on most downs. What I mean by that is Carson doesn’t have the foot frequency to avoid defenders at the next level, unless a play is designed for him that way (counter, draw, or read option). The runner is a bit older than most rookies due to his transfer from Oregon that forced him to sit out the 2012 season. He also has very thin lower legs with a larger frame on top which affects his balance. For him to find success, the back will need to be in a power running system as a part of a committee. Pros: The former Aggie is a very powerful runner who lowers his shoulders and drives defenders back with his strong, churning legs. This battering ram is great in short yardage/goal-to-go situations, always falling forward. Carson can get small in the hole, uses a few spin moves, stiff-arms, and shoulder shakes to break free into the open field. The back follows his blockers well, then squares up his shoulders to attack. He is a former basketball player with very soft hands who runs good routes while catching the ball in stride. Even though his wheel routes take some time to develop, they are very effective. Carson also anchors well in pass protection. The runner has fresh legs from only having one college season of 200+ touches. Overview: Carson reminds me quite a bit of Buffalo’s 2015 fifth round selection, Karlos Williams. I have my doubts he will ever be a featured back, but he can help an NFL team and your fantasy squad if he finds himself in a good situation. Right now, I have him just outside my top fifteen rookie backs. « Tyler Ervin: Little Engine that Could?